Unfortunately due to varying requirements among State by State CLE approval authorities for prerecorded material, we are not able to offer CLE credit for recorded webinars. We can only offer CLE credit for the live sessions. Most organizations are constantly struggling to contain the blitz of electronically stored information (ESI) assaulting their networks. The headlines are filled with stories of companies being thrown for a loss by data breaches and discovery sanctions because they failed to reduce their data stockpiles. Given this backdrop, can an offensive strategy of “information governance” realistically protect the ESI “blindside” of organizations? Most lawyers know that amendments were recently enacted to the discovery provisions of the Federal Rules of Civil Procedure, and much of the commentary on the amendments has taken the position that they will cure all of the present ills afflicting the discovery process. However, despite many useful improvements, the recent rule changes will have little to no effect on the manner in which discovery is conducted today without a corresponding change in discovery culture. 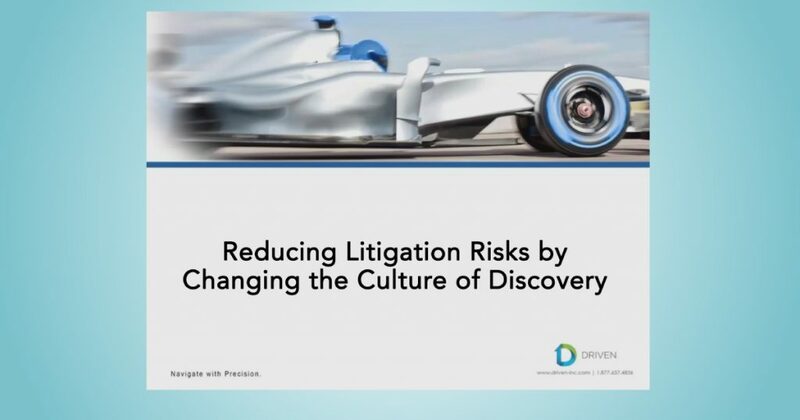 For such a culture change to occur, lawyers must spearhead changes within their organizational clients that can ultimately lead to reduced costs, speedier resolutions, and better traction in court. Companies and individuals implicated in government investigations are undeniably at risk. Because corporate criminal prosecutions are often built on electronic documents, having full command of electronic searches, subpoena responses, and productions is an increasingly crucial part of the defense strategy. Recent developments in the US government’s policies in corporate criminal cases have raised the stakes as well. This program will discuss handling simultaneous or parallel inquiries, ensuring compliance with government demands while protecting sensitive information and mastering important facts, and the evolving law surrounding the government’s use of electronic data in investigations. The End of the Privilege Log as We Know It? Change is in the air as courts and regulatory authorities alike seek to reduce ediscovery burdens. The traditional privilege log is ripe for reform considering the high cost of creating a privilege log, the limited utility of a privilege log to the receiving party, and the substantial risks resulting from a poorly executed privilege review and logging process.